We are going to Turkey tomorrow! I could not be more excited! 7 full days of sunny beaches, water fun, nice views, historical places and last, but not least majestic food are coming my way. I can not wait anymore! But before I go I have to show you this month’s Daring Bakers challenge. 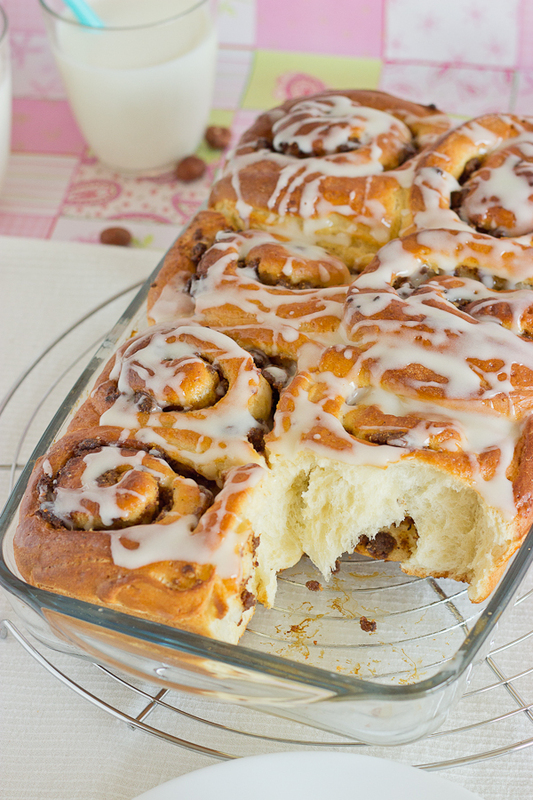 This month the Daring Bakers kept our creativity rolling with cinnamon bun inspired treats. Shelley from C Mom Cook dared us to create our own dough and fill it with any filling we wanted to craft tasty rolled treats, cinnamon not required! So I did Praline Rolls. I like to put nuts in everything, because as far as I’m concerned, that’s the most natural thing to do! 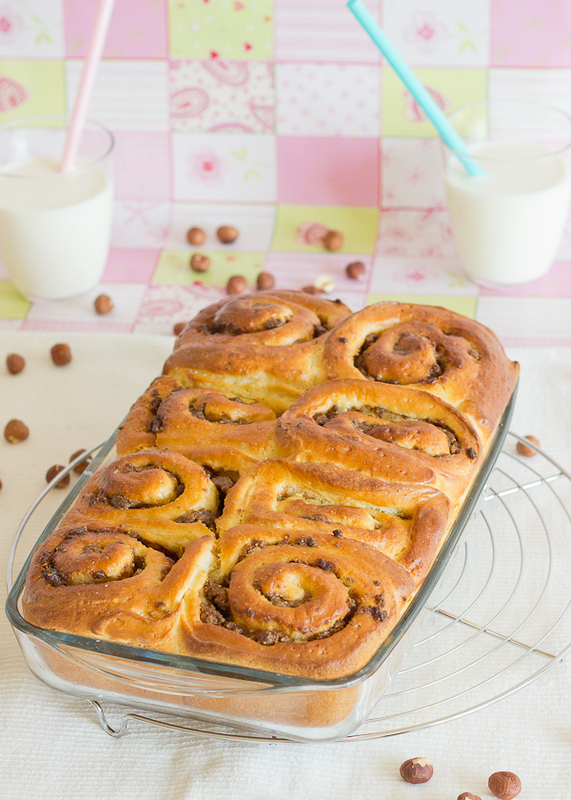 Obviously, the Praline Rolls tasted wonderful, and oh, that dreamy, earthy fragrance that the hazelnuts brought to the table, I can not live without it! Thank you Shelly for inspiring me to bake these rolls! 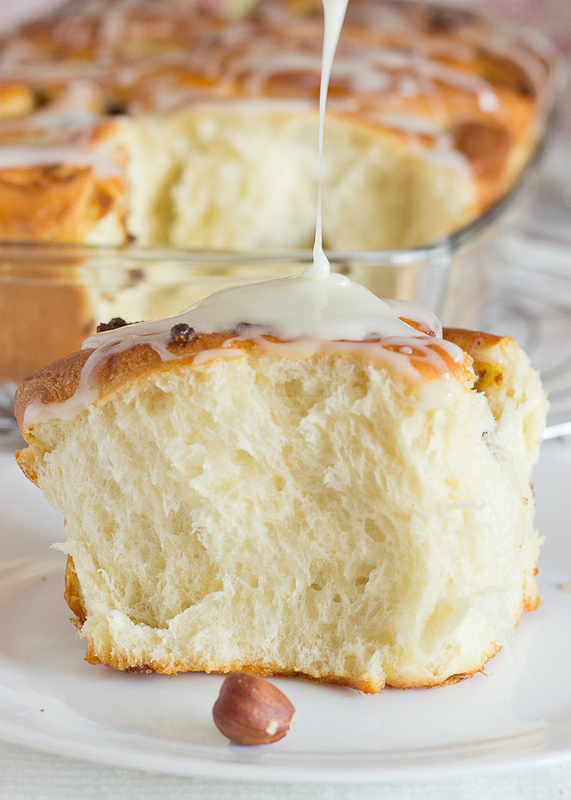 Light and fluffy homemade rolls with a luscious praline filling. Place a large heavy skillet over medium heat. Place the hazelnuts in the skillet and add the sugar. Stir with a wooden spoon a few times while the sugar is melting. Let all the sugar melt and wait until it starts browning, this will take around 10 minutes. Pour the caramel and the hazelnuts over a silpat, forming an even layer. Let cool completely. Break the praline and place the pieces in your food processor. Process until a smooth past forms. Add the butter and cream and process pulsing for a minute. In a large bowl mix the milk and yeast and stir with a large spoon or a silicone spatula until the yeast is completely dissolved . Add the melted butter (the butter should not be hot, but at room temperature) and eggs and mix thoroughly. Set aside one cup of flour. Add the remaining 4 cups and the salt to the liquid ingredients. Stir until a dough starts to form. Transfer the dough to a floured surface and start kneading. Gradually add the reserved flour to the dough, a tablespoon at a time. Add flour until your dough is no longer sticky, 600 gr. is usually how much I need. Knead the dough for 10 minutes, when you are finished it should be soft and elastic. Place the dough into a greased bowl, turning it once to grease all sides. Cover with a plastic wrap and let rise until double, approximately one hour. Take the dough out of the bowl and place it on a lightly floured surface. Press it gently and roll it into a 32/36 cm. (12,5/14 inches) rectangular. Spread the filling evenly over the dough, leaving a small edge on one of the long sides. Roll the dough, starting from the side opposite to the edge. Cut the formed log into 10 equal pieces. 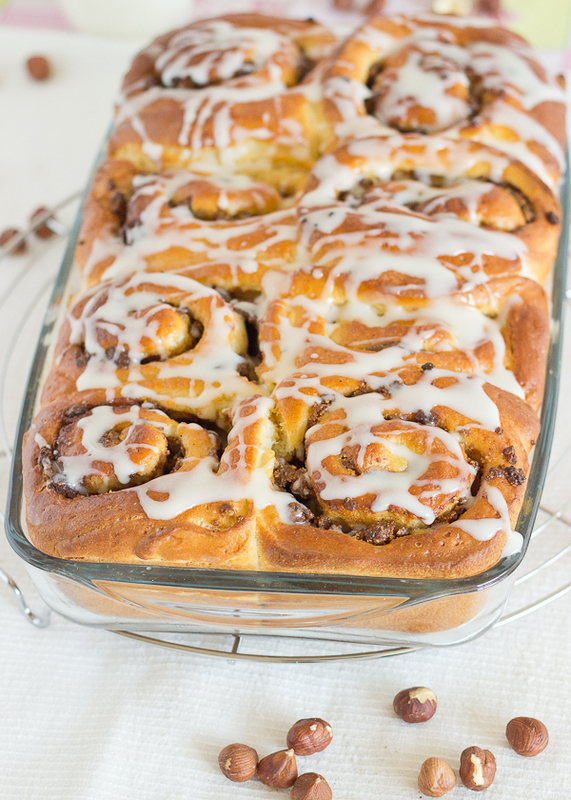 Arrange the rolls into a greased baking pan*, brush the surface with milk and cover with plastic wrap. Let them rise again until double, approximately 30 minutes. Preheat your oven to 190°C/375°F. 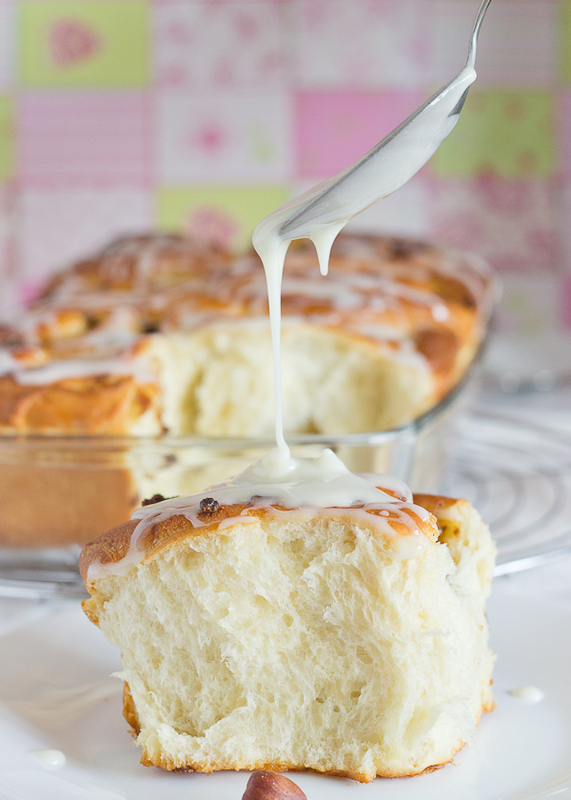 Remove the plastic wrap, brush the surface of the rolls again with milk and bake for 25 minutes. You can check the rolls with a toothpick to see if the are ready. Remove from the oven, brush with milk and let cool on a wire rack before glazing. Mix the cream cheese, milk and powder sugar in a bowl and whisk with a wire whisk until glossy. Pour the glaze over the cooled rolls. *Note: The pan I have prepared was not big enough for 10 rolls, so I baked them in two batches. Make sure your pan is at least 34/24 cm. (13/9 inches). 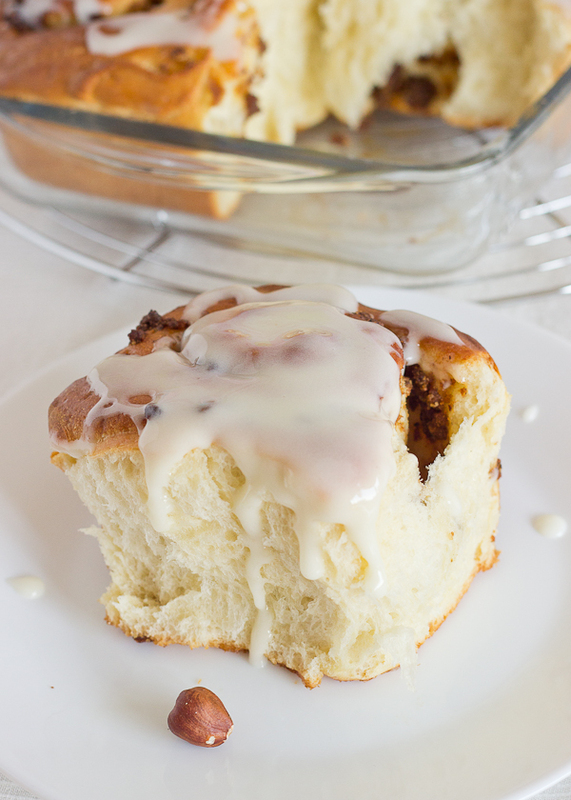 yummy rolls! have fun in Turkey! I’m going in August and I can’t wait!! Thank you! We are there now and it is great! 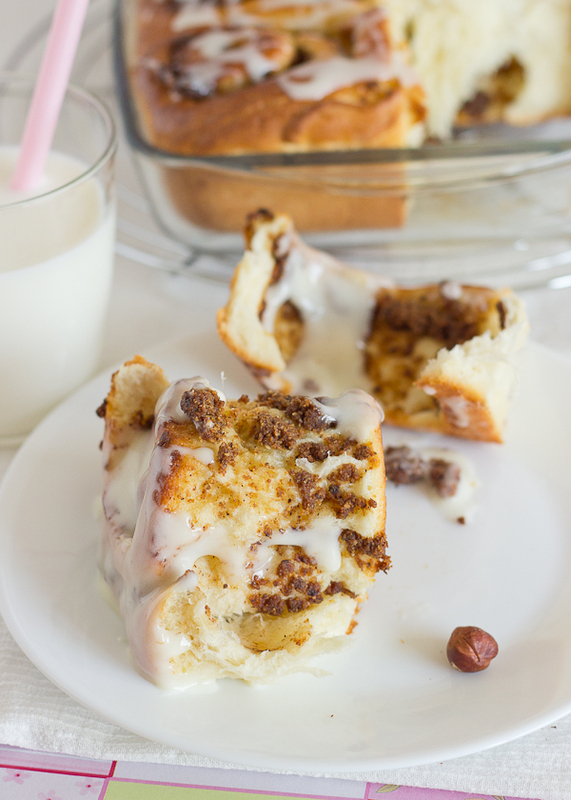 They look fabulous…and praline…that just sounds delicious too:) Great challenge! they look like a yummy breakfast!